Not since Carly Rae Jepsen&apos;s "Call Me Maybe" has a pop song from a new act cut through the summer radio waves like DNCE&apos;s "Cake By The Ocean." It checked every box: a cheeky double entendre, a splashy music video, a Jonas brother, Diddy, Naomi and frosting. And it turns out that the song&apos;s boardwalk-busting guitar riff had been lying around untouched for a decade. "We were in the studio in Sweden, figuring out what the vibe of the EP was going to be," singer Joe Jonas said at a Backstage with Citi event in the company&apos;s sleek Long Island City office. "[Producers Mattias Larsson and Robin Fredriksson] had this fun, wacky guitar part that they’d had for 10 years, but couldn’t find the right song for. When I heard it, in 15 minutes we had &apos;Cake By The Ocean,&apos;" Jonas said. "Let&apos;s call it 16 minutes." In less than a year, that rumbling guitar riff was everywhere. "Cake" spent 19 weeks on the Billboard Hot 100 and went platinum 14 times in 10 countries. When DNCE took home the Video Music Award for Best New Artist of 2016, critics (including our own Rob Sheffield) questioned the validity of the award. Can a person who has already sold 17 million records worldwide and graced the cover of Rolling Stone be considered a fresh face in pop? The first time the 27-year-old Jonas received the "breaking artist" nomination was at the Grammy Awards – seven years ago. 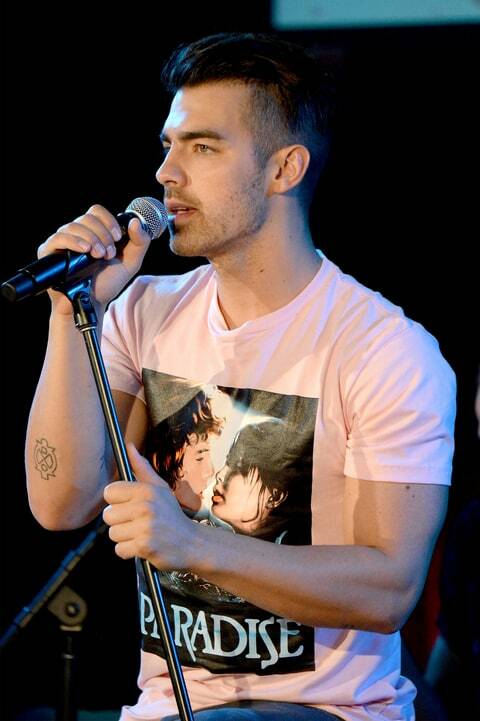 In 2011, Joe Jonas was poised for his post-JoBro career. He released Fastlife, his R&B-tinged solo debut that marked the customary step from boy bander to mature artiste. But the album floundered. Fastlife slipped off the Billboard charts without a memorable single, selling a fraction of what a Jonas Brothers album might have. In the context of his older and younger brothers, Joe was the smoldering one. Without them, he simmered, as fully-formed soloists like Bruno Mars and Adele became superstars. 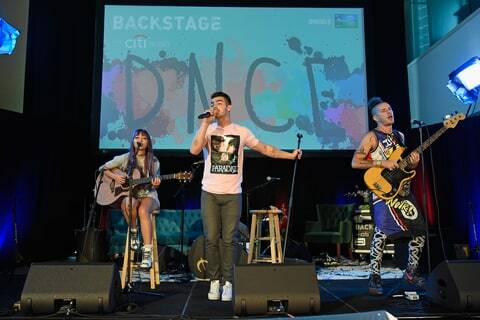 With DNCE, Joe is back to brooding at the mic while his new bandmates soak up the spotlight around him. The new material is imbued with the kind of nouveau-funk pep Jonas may have originally envisioned for Fastlife. In lieu of actual family, Jonas recruited the next closest thing: his longtime Jonas Brothers drummer Jack Lawless, who shares Joe&apos;s affinity for edgy rock bands like Beastie Boys and Foo Fighters. "Those bands took music seriously, but they also had these great concepts," Jonas said. DNCE found its &apos;Flea&apos; in bassist Cole Whittle. With a Jean-Michel Basquiat tattoo and cartoon-like tuft of hair, Whittle is Jonas&apos;s onstage foil. After studying jazz at the Berklee School of Music and playing in alternative rock band Semi Precious Weapons, Whittle wasn&apos;t banking on being a pop star, he said. "I completely missed out on the Jonas Brothers," he said with a smile. "So when I met Joe it was on a human level that we became friends instantly … I don&apos;t hear &apos;Burnin&apos; Up&apos; when I look into his eyes." Rounding out the group is ax-woman JinJoo Lee, who grew up in South Korea idolizing American blues guitarists before sharing stages with pop queens like Charli XCX and Demi Lovato. "I grew up watching blues and soul artists like Stevie Ray Vaughan, B.B. King and Eric Clapton," said Lee. "I remember being in my room when the radio was playing Vaughan and it sent [goosebumps] up my arm." Lee began playing guitar at age 12. Her older siblings were in a professional band, which she later joined before moving to Los Angeles for school with no English language skills and only a suitcase of belongings. "I was scared … But I think when you move to another country to pursue your dream, it means you are really ready." DNCE will release a full-length debut album this fall off the strength of their Swaay EP with catchy gems like "Pay My Rent" and "Toothbrush." "I like to describe it as a house party and every song is a different room," Whittle said of the new LP. "Some rooms are crazy and some are a little sexier," he said with a smirk. While DNCE&apos;s music may be all about partying, the band revealed that when they actually let loose on the road, their favorite place was beside the stage at a Willie Nelson concert. "We were playing a festival and found out that [Willie Nelson] was playing the stage right next to ours," said Jonas animatedly, "So after we played, we all sneaked over to watch." Nelson&apos;s 1978 album of American pop standards, Stardust, is what the band breathes while on long tour stretches. There&apos;s something to be said for having a crew, and a soundtrack, to enjoy the ride with. Jonas said being in a band of peers affords you a build-in support system solo artists don&apos;t necessarily have. "We give each other advice about getting out of our own heads when we’re running around on a few hours&apos; sleep," Jonas said. "We have to remind each other that millions of people out there wish to play just one show." Can the Future of 'Final Fantasy' Escape Its Own Past?